If you’ve ever searched for dinos on the Internet, chances are, you’ve come across the drawings of Nobu Tamura. What began as a hobby in 2006, when he realized most dinosaurs on Wikipedia had no photos due to copyright, Tamura is now one of the most prolific producers of up-to-date paleo critters on the web. He’s shared with us his 19 favorite. For his complete works, check out his blog. More than one kilometer beneath the Chesapeake Bay in Virginia, geologists discovered 100- to 150-million-year-old water from the Atlantic Ocean’s infancy. The ancient water hid under a more recent 56-mile-wide crater left after a massive rock or block of ice nailed the Earth near what is now the entrance to the bay. 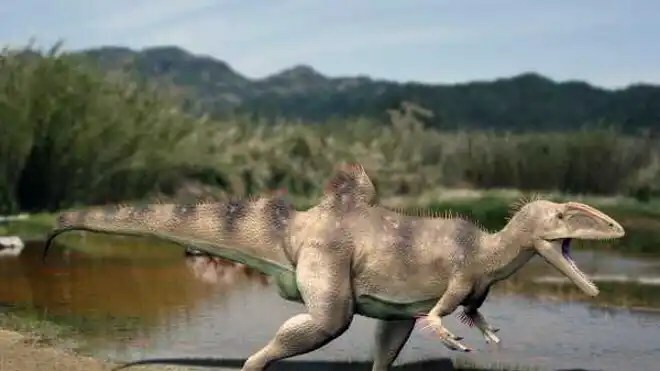 U.S. Geological Survey (USGS) hydrologists didn’t know the water beneath the crater dated from dino days until they analyzed the chemicals in the water. The water held forms of chloride and bromide, along with other chemicals, that allowed the scientists to estimate the water’s age. And while older water is known from Canada , the Chesapeake Bay impact water is now the oldest large body of water known on the planet. “Previous evidence for temperature and salinity levels of geologic-era oceans around the globe have been estimated indirectly from various types of evidence in deep sediment cores,” said lead author Ward Sanford, USGS research hydrologist, in a press release. “In contrast, our study identifies ancient seawater that remains in place in its geologic setting, enabling us to provide a direct estimate of its age and salinity.” Sanford and colleagues published their findings in the journal Nature . The ancient water contained twice the salt content of the modern ocean and dates from the early Cretaceous Period, when dinosaurs dominated the planet and the newborn north Atlantic was more of a lake than an ocean. In the late Jurassic Period, 150 million years ago, pieces of the Earth’s crust, called tectonic plates, split to divide Europe from North America and Africa. This split formed a rift basin filled with extremely salty water that would later become the Atlantic Ocean. However the Atlantic would have to wait 50 million years until the mid-Cretaceous for a space to open between what is now Central and South America, just as the narrow Strait of Gibraltar now allows the Atlantic Ocean and Mediterranean Sea to mingle. Before the north Atlantic connected with the rest of the world’s waters, some of that briny water became trapped underground beneath a coastal plain and isolated. The water remained largely unchanged until approximately 35 million years ago when a meteor or comet slammed into the Earth during the late Eocene Epoch. That impact created massive tsunamis that swept far inland and devastated the Atlantic coast of North America, yet helped to preserve the Cretaceous ocean water. The process that made the infant north Atlantic so salty can still be seen today. The Dead Sea contains extremely salt water because more water evaporates out of the sea than flows into it. The Uyuni salt flats of Bolivia serve as an example of what happens when an inland sea completely dries out. Even the Mediterranean nearly became a salt flat during a period from 5.96 to 5.33 million years ago when the sea’s connection to the Atlantic intermittently closed. Feeling better, hopefully will be over it for the most part tomorrow, I have a business meeting…sigh.